Imagine you are forced to jump out of an airplane. Luckily, you find a parachute that even has a backup chute. You leap out of the plane and free-fall. You pull the cord to open your parachute, but it doesn’t open. Don’t panic, though, you have a backup. But, you pull that cord and nothing happens. Now you face the reality of a death as firm and un-yielding as the ground rushing into your view. This air disaster mirrors the mechanism and mortal threat posed for people born with the genetic problem that causes spinal muscular atrophy (SMA). 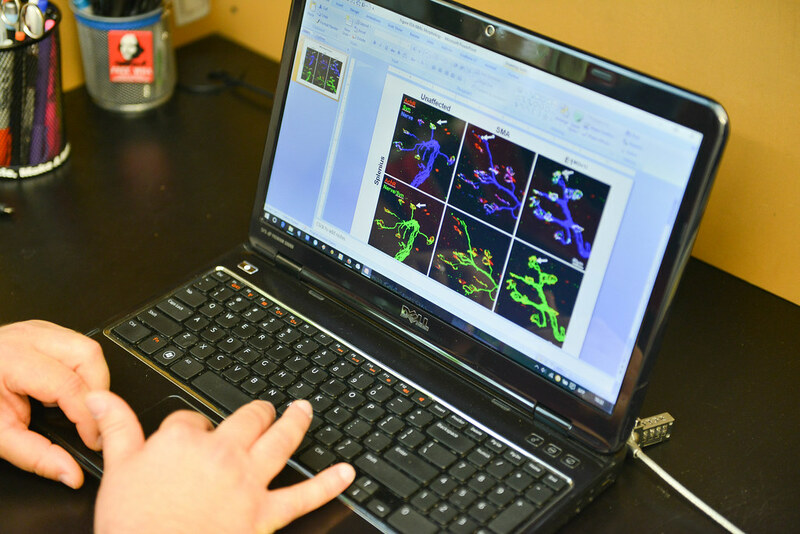 Chris Lorson’s lab at the Bond Life Sciences Center would like to change that situation by making an effective genetic backup to the defective gene that results in SMA. The journal Molecular Therapy, a publication of Nature, recently accepted their findings for publication. The defect occurs in a specific gene called Survival Motor Neuron (SMN). If the SMN gene is defective because of mutation, this causes a deficiency of the SMN protein it is supposed to produce. Without this protein, the neurons that control muscle movement malfunction. Signals cease to stimulate muscles. Muscles that are not stimulated atrophy, grow weak and waste away. At first this happens with the skeletal muscles, which leads to loss of motor function for simple activities like walking and swallowing. If it happens with the muscles that control breathing, you die. News of the disease often presents a devastating prognosis. Infants have it worst; babies diagnosed with SMA only have a life expectancy of two to five years from birth. Fortunately, our bodies have a sort of backup for the SMN gene, another one called SMN-2. But, like a useless backup parachute for an unlucky skydiver, SMN-2 isn’t actually very good at producing proteins of the quality needed to stave off SMA. It might just be a vestigial trait on its way down the evolutionary drain — it doesn’t even exist in the closest primate relatives of humans. Discoveries in the Lorson lab look to make the SMN-2 gene an effective backup, and their recent publications indicate that this may be a viable possibility for future SMA treatments. Once bound to SMN-2, the ASO is designed to alter mRNA splicing, “essentially, the editing of a gene,” Lorson said. Speaking in terms akin to products leaving a factory, Lorson said that the attached ASO makes SMN-2 produce good quality proteins, the ones that it wasn’t able to produce before. In other words, suddenly the backup protein-factory that was making poor-quality products is now pumping out top-of-the-line stuff that will work. Previous research identified a strong ASO contender to experiment with, and Lorson said current research is about optimizing an ASO to extend survival times in mice with SMA — from just 13 days to five months after only one injection at birth. Lorson stressed that his lab’s achievement doesn’t promise a fast cure for SMA. He said it is unlikely a single compound will address the full gambit of effects that people with SMA suffer, especially given that people can be identified as having SMA at any time from birth through later in life — often late onset SMA tends to be less severe than diagnosis as an infant. Lorson’s work is funded in part by Cure SMA, FightSMA and the Gwendolyn Strong foundations. Erkan Osman, a post-doctoral fellow in Lorson’s lab and the first author on the most recent paper, won the emerging investigator award from FightSMA and Gwendolyn Strong in 2015. How does Zika move from mother to child? Scientists believe they have a better way to study how Zika virus can spread from a pregnant mother to her fetus — and their technique doesn’t even involve observations of babies in the womb or post-natal examinations. “As soon as we heard about Zika, everybody’s light bulbs turned on,” said Megan Sheridan, a graduate student at the University of Missouri Bond Life Sciences Center. 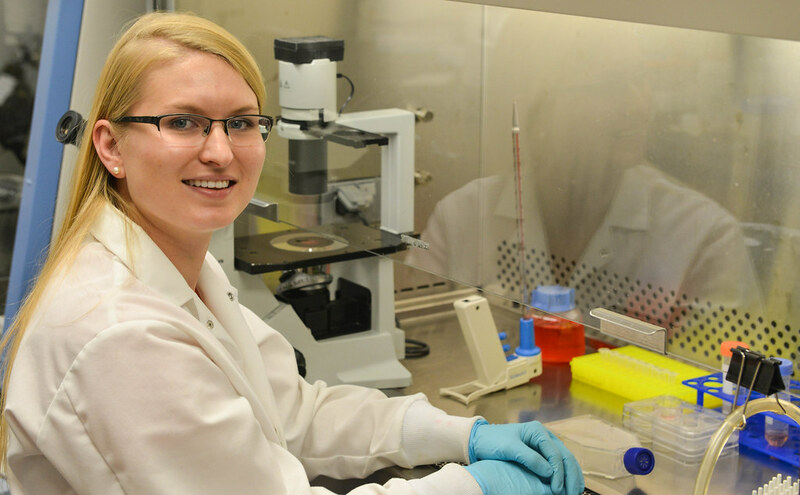 Sheridan works in the lab of Toshihiko Ezashi at Bond LSC, and she, in turn, is part of a cross-campus team researching Zika with R. Michael Roberts, Alexander Franz, Danny Schust and Ezashi. Roberts’ lab studies pluripotent stem cells — progenitor cells which can develop into any other type of cell in the body. 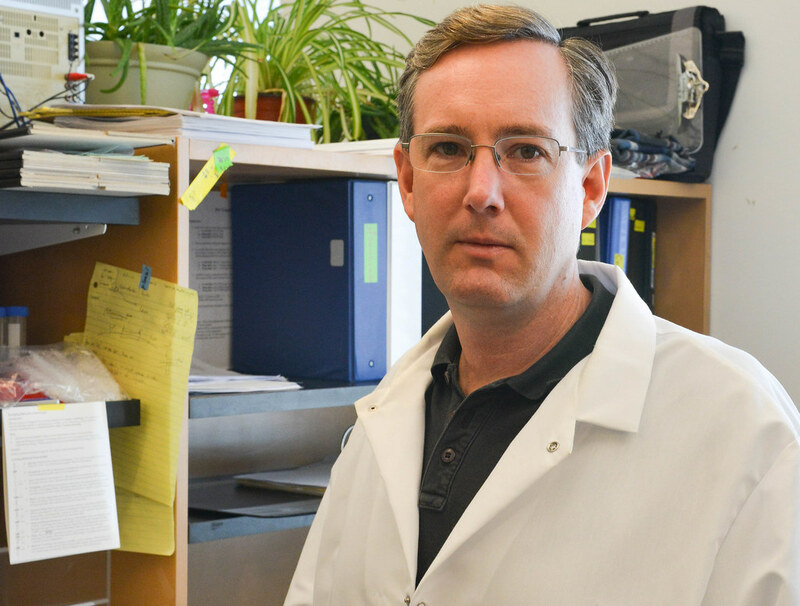 “We use the proper signals to drive stem cells to become like placental cells,” Sheridan explained. 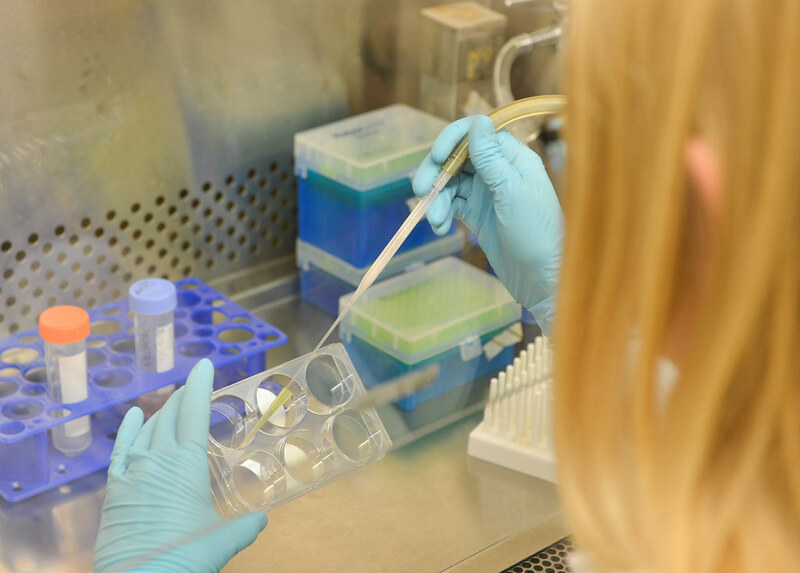 With this capability to stimulate stem cells with growth hormones and inhibitors at opportune moments, Roberts’ researchers realized they could create enough placental cells to create an environment similar to that of a womb in very early stages of pregnancy. This is something which Sheridan thinks hasn’t been done before in regards to studying placental interaction with Zika. Their technique could give a look into the first trimester, when epidemiological studies say a fetus is most susceptible to infection. Roberts’ lab is trying to understand the placental barrier’s vulnerability to Zika virus in its early stage of pregnancy. During this time, an infection could occur even before the mother is aware she is pregnant. If the lab uses their technique to understand how Zika virus enters placental cells, then potentially they could also learn how to strengthen the placenta as a barrier to Zika and make it a first line of defense against infection of the fetus in the womb. If developing babies don’t get infected with Zika, then they won’t suffer the consequences of birth defects. One such defect is microcephaly where a baby is born with a smaller than expected head, which may in turn be a sign that their brain has not fully developed. While infection with Zika virus is rarely fatal or otherwise severe in itself — many people don’t even develop symptoms — birth defects like microcephaly could cause further developmental problems like delays in learning how to speak and walk, intellectual disabilities, difficulty swallowing and problems with hearing and vision, according to global health organizations. Microcephaly only became a widely documented effect of Zika after a particular strain surged across South and Central America with the infected mosquitoes that carry it, Sheridan explained, but this may be in part because previous Zika infections and outbreaks were themselves poorly documented. While birth defects caused by Zika have drawn much media attention as the disease has spread northward through our hemisphere from Brazil, studies focusing on infection in the womb have only used placental material that has come to term. This may not be the most accurate way to see how the placenta gets infected in the first place early in pregnancy. The pathway of Zika virus infection in lab mice isn’t really comparable to human infection, because mice aren’t infected with this virus naturally. Only lab mice that have had their genomes altered to be able to acquire the virus have susceptibility to the infection that can be modeled. Roberts’ lab is currently working with the African strain of Zika and obtained strains from Southeast Asia and Central America recently. There’s about a 99 percent genetic similarity across strains, Sheridan said. Zika virus was first discovered in Africa in Uganda in 1947, according to the Centers for Disease Control and Prevention. The first human case was documented in 1952, and subsequent outbreaks also occurred in Southeast Asia and the Pacific Islands. The Pan American Health Organization issued an alert about the confirmed arrival of the virus in Brazil in May 2015. The lab has completed Zika infections of some of their stem cell-produced placental cells. Sheridan reassured that even though the lab works with live viruses, Zika is not airborne, and none of their work involves mosquitoes. Roberts’ lab submitted one grant application earlier this year to the National Institutes of Health for funding for their research. While that application was denied, Sheridan said that they have a lot more preliminary data now and are hoping to submit a revised grant soon. She said that their original work was “highly scored, but the funding level is still low,” meaning that obtaining funds for research into Zika virus is highly competitive nationally. Legislation to fund more efforts into studying and preventing transmission of Zika virus is caught in congressional gridlock, according to The New York Times and other media outlets. Please visit the CDC’s dedicated page for more information on Zika virus — including advice for travellers and pregnant women, description of symptoms and treatment, steps you can take to control mosquitoes and prevent other means of transmission of the virus and more background on the history and effects of the disease. Professor Lloyd W. Sumner introduces University of Missouri Metabolomics Center. The new center provides leading-edge equipment to gain crucial information on the complex biology of health and disease in plants, animals and humans. The center, located on the second floor of the Christopher S. Bond Life Sciences Center on the MU campus, is one of a few in the country that encourages interdisciplinary research in metabolomics. For a tiny spore, anthrax holds a lot of danger and promise. If you found yourself wondering about more than its safety in the lab, we have a answers to a few persistent questions. What makes anthrax dangerous, and how does it spread? How common are infections of it in nature? If we have antibiotics that already treat it, beyond finding new and better ones why study the organism? Anthrax bacteria are highly resilient organisms. Like only a few other bacteria in nature, they produce spores with protein-shelled casings that lay dormant in soil for long periods of time, waiting to be taken in by grazing animals like cattle and sheep. Once they enter the nutrient-rich environment of an animal’s bloodstream — exactly how the bacteria gets there after entering an animal’s mouth is unknown — spores germinate inside the white blood cells that absorb them. As anthrax reproduces rapidly inside its host, it releases toxins that quickly kill the infected animal. That sometimes happens in just a matter of hours according to farmers’ accounts, said George Stewart, Bond Life Sciences Center scientist, medical bacteriologist, McKee Professor of Microbial Pathogenesis and chair of Veterinary Pathobiology at MU. When infected animals die the bacteria are exposed to oxygen in air that penetrates the decomposing body and new spores escape as the dead host decays. The newly-produced spores are deposited back into the soil, where they wait in a state of suspended animation for as long as it takes to be ingested by another grazing animal, sometimes decades to a hundred years. Sporadic, natural outbreaks of anthrax can happen almost anywhere in the world except Antarctica, as the spores have been found to exist worldwide, Stewart said. In the United States, outbreaks in cattle and bison usually happen in the Plains and West in states like Colorado and Wyoming — anywhere that cattle or sheep have been raised or their wildlife equivalents graze, lending to the descriptor from Stewart of “anthrax belt” for the states stretching from Texas to the Dakotas. During the Cold War, the U.S. and the Soviet Union, among others, were attracted to anthrax for their respective biological weapons programs because of the hardiness of the organism and high lethality rates of untreated gastrointestinal and, especially, pulmonary anthrax infections in humans. Today, Americans’ are probably most familiar with anthrax from the mailing attacks of 2001, when letters containing weaponized anthrax spores were delivered to the offices of media outlets and politicians, infecting 22 people and killing five. Hero in a half-life shell? Despite their grim reputation, anthrax spores hold a lot of potential for Stewart. The outermost layer of the protein-shell structure of a spore holds particular interest — how it’s made, what proteins it’s composed of and the function of those proteins. Studying it could not only help find future anthrax vaccines and therapies, but also be used for other applications. 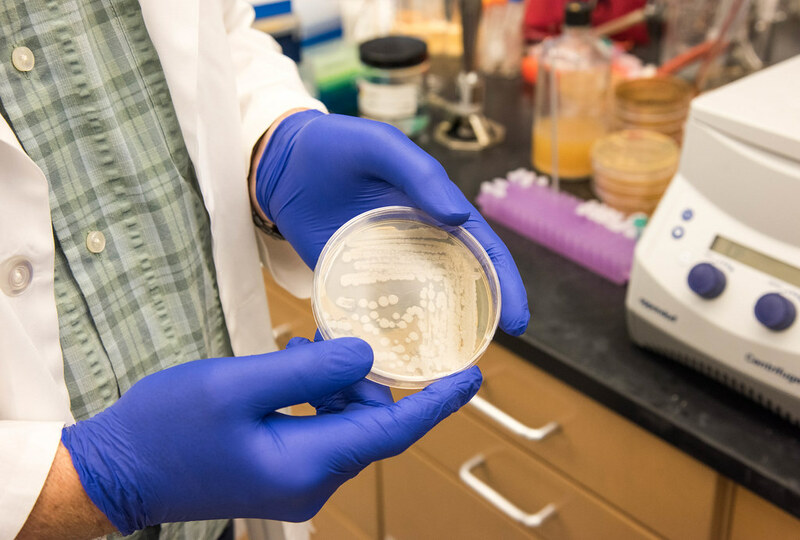 Scientists have coated spores of a close biological relative of anthrax, Bacillus thuringiensis, with plant growth-promoting and anti-insect enzymes and other proteins to treat crops. Its durable structure in the form of the spore’s protein shell attach to these enzymes and remain longer in the environment, making them more effective, Stewart said. This long biological half-life even presents potential for bio-remediation work — using natural organisms to cleanse the environment of toxins and pollutants. In the case of B. thuringiensis, this might include cleaning up soil from the herbicide atrazine and the notorious pollutant dioxin, a by-product of various industrial processes including incineration, smelting and the production of paper pulp and some herbicides and pesticides. According to collective findings of the National Institutes of Health and Environmental Protection Agency and others, atrazine is probably not a human carcinogen but can cause genetic damage in animals and is still acutely toxic to people at high enough levels. According to the World Health Organization (WHO), dioxin causes cancer and other ill human ailments. Pollutants that contaminate soil can eventually leech into groundwater and also enter the food supply through grazing animals. That makes organisms adapted to living in soil like B. thuringiensis perfect candidates as potential carriers of agents used to clean up soil pollutants like atrazine and dioxin. So is anthrax a dastardly bio-villain or a misunderstood hero? The truth is neither. Anthrax bacterium is just another living thing. As a predator of other living things, needing to feed to survive and reproduce, it goes about its life cycle without any conscious agenda. It has no malice, and unlike a wolf, shark or hawk it doesn’t have a brain so it doesn’t even have instinct, only genetic code to mindlessly live by. How we interact with anthrax is largely dependent upon us humans. We have the vaccines to prevent it and antibiotics to treat it if it makes us sick. After that, we can harness and modify anthrax’s natural power for ill as a weapon, or maybe to do some good in the environment. So long as we have the technology to study and manipulate organisms like anthrax, the potential for both scenarios will always be there. 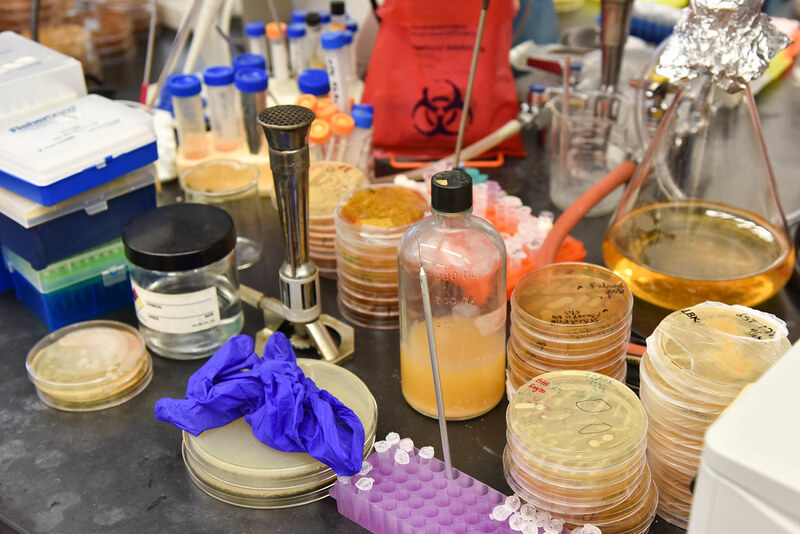 Meanwhile, at MU Stewart will continue to study anthrax, searching for its secrets in order to better understand it, to better serve the rest of us. Next time you squirt mustard on a sandwich on enjoy wasabi with your sushi, you can thank a battle between broccoli and butterflies. Just ask Bond LSC biologist Chris Pires, our latest scientist in our Decoding Science audio series that runs on KBIA, 91.3 FM. Pires has studied the process of co-evolution between plants in the order Brassica — including broccoli, caulifower and kale — and insects in the cabbage butterfly family to prove that this back and forth helped make both into what they are today.